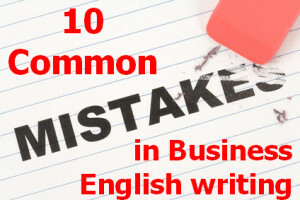 Do you make these common mistakes when writing business English letters and e-mails? Read today’s lesson and learn how to avoid the errors that can make your writing look unprofessional! To learn common phrases for business English letters, e-mails, interviews, meetings, presentations, negotiations, and more – check out the Business English Course. 1. I am writing in respect of our recent purchase. 2. We would like to regret the delay in shipping. 3. I ensure you that our products are of the highest quality. 4. Your order will be shipped until Wednesday at the latest. 5. I would like to request some informations about your services. 6. We except all major credit cards as well as checks and money orders. 7. We appreciate your cooperate. 8. I want you to send me the files right now. 10. I am looking forward to hear from you. Learn English for Career Success!